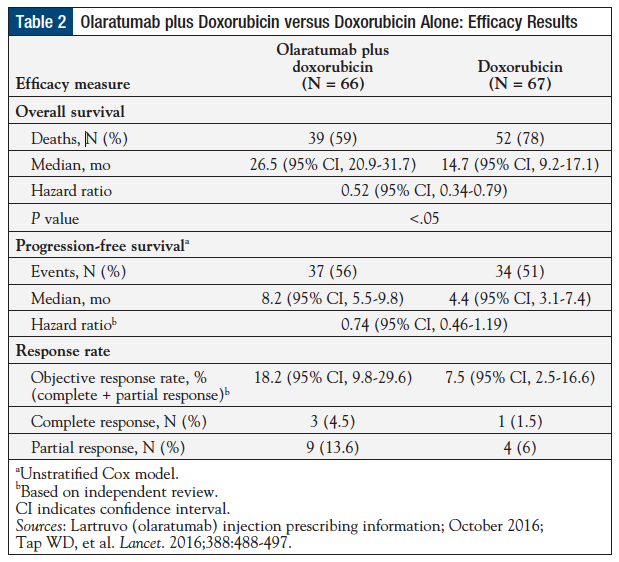 Treatment with olaratumab plus doxorubicin demonstrated a significant improvement in overall survival; patients who received the combination lived a median of 11.8 months longer than those who received doxorubicin alone (Table 2). The accelerated FDA approval of olaratumab, for use in combination with doxorubicin, marks the availability of the first new frontline therapy for soft-tissue sarcoma since the approval of doxorubicin more than 4 decades ago. Olaratumab, a PDGF receptor-alpha–blocking antibody, is a new treatment option for patients with soft-tissue sarcoma, a complex disease with more than 50 subtypes and a poor prognosis, particularly in advanced stages. In the pivotal clinical trial involving 133 patients with more than 25 subtypes of metastatic soft-tissue sarcoma, treatment with olaratumab plus doxorubicin de­monstrated a significant improvement in overall survival, median progression-free survival, and objective response rate. National Cancer Institute. Adult soft tissue sarcoma treatment (PDQ)—health professional version. Updated January 29, 2016. www.cancer.gov/types/soft-tissue-sarcoma/hp/adult-soft-tissue-treatment-pdq. Accessed October 25, 2016. American Cancer Society. Sarcoma: adult soft tissue cancer. Revised October 21, 2016. www.cancer.org/acs/groups/cid/documents/webcontent/003138-pdf.pdf. Accessed October 26, 2016. National Comprehensive Cancer Network. NCCN Clinical Practice Guidelines in Oncology (NCCN Guidelines): Soft Tissue Sarcoma. Version 2.2016. February 19, 2016. www.nccn.org/professionals/physician_gls/pdf/sarcoma.pdf. Accessed October 26, 2016. Mayo Clinic staff. Diseases and conditions: soft tissue sarcoma. July 1, 2015. www.mayoclinic.org/diseases-conditions/soft-tissue-sarcoma/basics/definition/con-20033386. Accessed October 26, 2016. Tap WD, Jones RL, Van Tine BA, et al. Olaratumab and doxorubicin versus doxorubicin alone for treatment of soft-tissue sarcoma: an open-label phase 1b and randomised phase 2 trial. Lancet. 2016;388:488-497. Erratum in: Lancet. 2016;388:464. US Food and Drug Administration. FDA approves first drug to show survival benefit in liposarcoma. Press release. January 28, 2016. www.fda.gov/NewsEvents/Newsroom/PressAnnouncements/ucm483714.htm. Accessed June 30, 2016. US Food and Drug Administration. FDA grants accelerated approval to new treatment for advanced soft tissue sarcoma. Press release. October 19, 2016. www.fda.gov/newsevents/newsroom/pressannouncements/ucm525878.htm. Accessed October 21, 2016. Lartruvo (olaratumab) injection [prescribing information]. Indianapolis, IN: Eli Lilly and Company; October 2016. Lilly. FDA approves Lilly’s Lartruvo (olaratu­mab) in combination with doxorubicin for soft tissue sarcoma. Press release. October 19, 2016. https://investor.lilly.com/releasedetail.cfm?ReleaseID=994445. Accessed October 21, 2016. Eisenhauer EA, Therasse P, Bogaerts J, et al. New response evaluation criteria in solid tumours: revised RECIST guideline (version 1.1). Eur J Cancer. 2009;45:228-247. ClinicalTrials.gov. 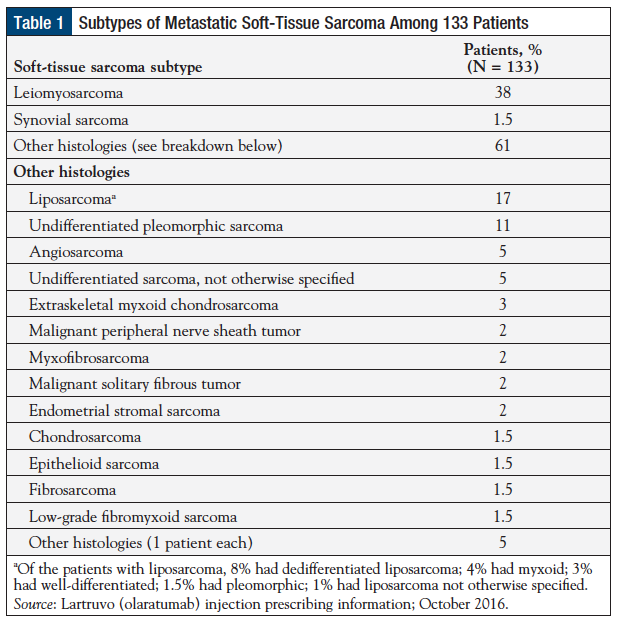 A study of doxorubicin plus olaratumab (LY3012207) in participants with advanced or metastatic soft tissue sarcoma (ANNOUNCE). https://clinicaltrials.gov/ct2/show/NCT02451943?term=NCT02451943&rank=1. Accessed October 25, 2016.